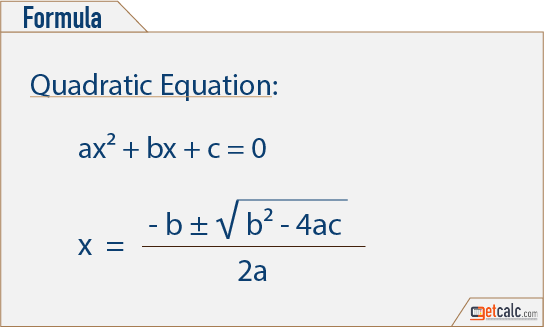 getcalc.com's Quadratic Equation calculator, formula & complete work with step by step calculation is an online basic math function tool to find the unknown value of x or roots in the equation ax2 + bx + c = 0. This calculator is featured to generate the complete work with steps for any set of valid input values of quadratic coefficient a, linear coefficient b and constant c. To generate the work with steps, supply the valid input values and hit on "CALCULATE" shows "GENERATE WORK" button along with the results. Generate the work with simply click on the "GENERATE WORK" for the values loaded in the quadratic equation calculator. Any equation which is formed like ax² + bx + c = 0 is a Quadratic Equation, where a is a quadratic coefficient, b is a linear coefficient and c is a constant. In the equation, "a" is a non-zero value. The equation becomes linear if "a" in the equation equals to zero. The highest exponent of the equation is always 2. By solving the equation, the unknown value or roots of x be found. The unknown values of x or roots of x is the range of values which varies between lower & upper limits. The below is a mathematical representation for quadratic equation and the formula to find the unknown roots of x by using the quadratic coefficient a, linear coefficient b and constant c. Users may use the quadratic calculator to verify the results of roots.